Each year, oxygen-requiring aquatic organisms in the Gulf of Mexico die. During summers in the Gulf of Mexico, oxygen levels become depleted – a condition called hypoxia. The area in which this occurs is referred to as the Dead Zone. The Dead Zone has been increasing year to year since 1993. Annually, the Dead Zone grows to about 7,000 square miles – larger than the state of New Jersey or Massachusetts. The Gulf of Mexico is an extremely important ecological system in North America. It is the ninth largest body of water in the world, and supports vibrant fisheries and a variety of aquatic organisms. The Gulf touches the coasts of Florida, Alabama, Mississippi, Louisiana, and Texas in the United States, as well as the states of Veracruz, Tabasco, Yucatan, Tamaulipas, and Quintana Roo in Mexico, and Cuba. Major fishing industries of the three countries are supported by the Gulf of Mexico. 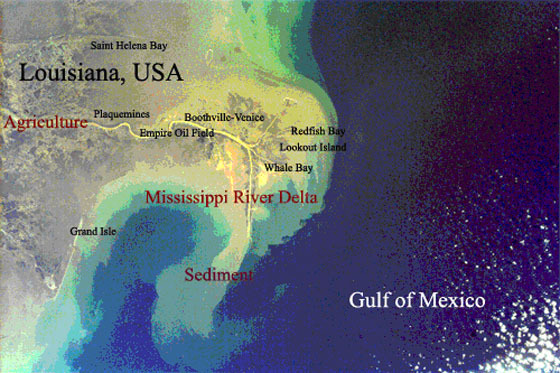 The Dead Zone in the Gulf of Mexico is caused by human activities in the upstream Mississippi River watershed, and enhanced by natural changes in the environment and climate or weather. Contributors include nitrogen fertilizer, animal manure, atmospheric deposition as a result of automobiles and fossil-fueled power plants, and waste. Pollution areas as indicated by red text. Farmers spray their land with pesticides and other types of fertilizers, in order to protect their crops. When it rains, soil is washed off the farms and into nearby rivers and bodies of water. The farm runoff includes animal manure, fertilizers, and heavy metals. 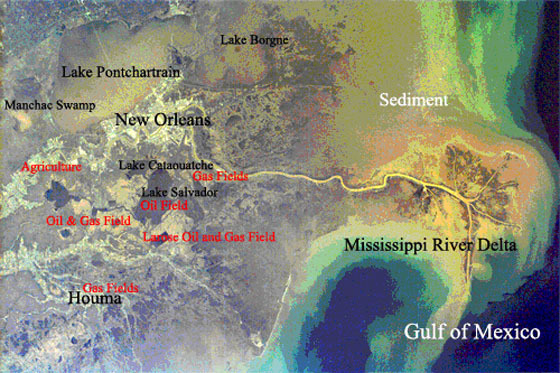 Downstream, in this case, the Mississippi River Delta and the Gulf of Mexico, the pollutants cause eutrophication – the presence of an excess amount of nutrients (ie., nitrogen and phosphorous). Algal blooms result from this process. Eventually, the blooms die and fall to the sea floor, where they then decompose. During decomposition, oxygen is consumed. In the summer, the oxygen is so depleted that the water becomes stratified, thus preventing the water along the ocean floor from becoming re-oxygenated. The oxygen levels fall to below the minimum amount necessary for aquatic life. 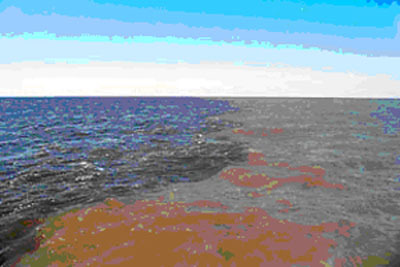 The weather – sun intensity, and rain – also causes dead zones. Strong sun intensity (most abundant in summer) aids algal growth. High rainfall increases runoff of nutrients to the Gulf. As found by the United States Geological Survey, more than 70% of the nitrogen in the Gulf of Mexico originated above where the Ohio and Mississippi Rivers meet. According to the USGS, 39% comes from Illinois, Iowa, Missouri, Minnesota, and Wisconsin, while 22% comes from the Ohio River basin, and 11% from the Missouri River basin. The rest comes from the states closest to the Gulf of Mexico – Arkansas, Louisiana, Mississippi, and Tennessee. Pollution has doubled in less than 50 years, as the result of increases in dissolved nitrogen and phosphates into the water. 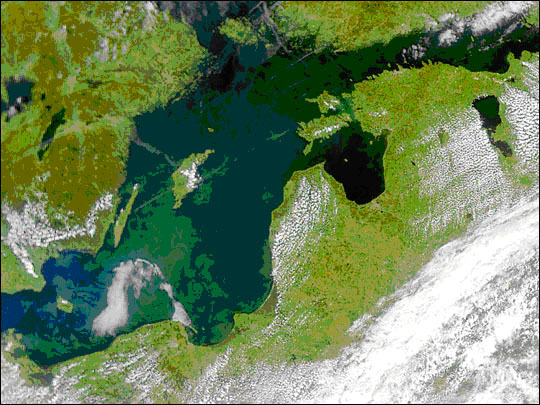 Phytoplankton bloom in the Baltic Sea. Where do dead zones occur? Dead zones, generally, occur along coastlines, especially near mouths of rivers. Most notable are the Dead Zone in the Gulf of Mexico, by the mouth of the Mississippi River, the Black Sea, the Baltic Sea, parts of the Long Island Sound, and the Chesapeake Bay. How big is the Dead Zone? The size of the Dead Zone changes every year. Generally, during dry years, the Dead Zone shrinks, and in years with many floods, the Dead Zone grows. That is due to the fact that flooding waters carry more sediments, which are infused with fertilizer, waste, etc. Aquatic organisms that dwell in the dead zones are the most obviously affected. However, humans are affected by such areas as well. For example, the ocean’s seafood production abilities are seriously hindered by dead zones. Most of the United States’ seafood comes from the Gulf Coast and Alaska. Freshwater lakes are being contaminated with the nutrients that cause dead zones as well, resulting in fish kills, and unpleasant smelling waters. Our food supply and recreational areas are all affected by dead zones. First of all, reducing the use of nitrogen fertilizer can decrease the presence of dead zones. Preventing excess nitrogen discharges into rivers and other bodies of water is also essential. One of the best solutions is to restore the Midwestern wetlands. Forests can absorb the excess nitrogen as well, so plant more trees! 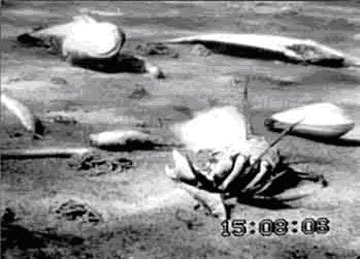 Underwater camera capture of the Baltic Sea floor showing dead and suffocated fish, clams, and crabs.